Samuel Okon Peter (born September 6, 1980) is a Nigerian-American professional boxer who held the WBC heavyweight title in 2008. He rose to prominence in his early career following a string of knockout wins, at a time when the titles of the heavyweight division were largely fragmented. 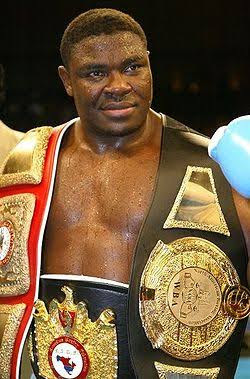 In March 2008, Peter won a portion of the world heavyweight championship by knocking out Oleg Maskaev to win the WBC title. In October, in what would be his only defense of the title, Peter lost to a returning Vitali Klitschko, who stopped him in eight rounds. Peter is known for his rivalry with the Klitschko brothers, having faced Wladimir twice (in 2005 and 2010) and Vitali once.